An idle game frantically design-documented in the span of a day for the 1-Bit Clicker Jam, and obsessively worked on for the following three weeks. 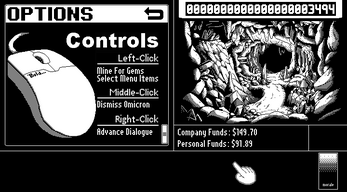 You and your kobold mining partner Omicron stumble into an unclaimed enchanted cave filled with a seemingly inexhaustible supply of glittering gems; from there, the two of you start a mining company and work together to extract as much profit from this situation as quickly and ethically as possible. The final version will not be compatible with save files from this version, but it should be different enough to warrant starting over. Keep this in mind as you go in. As of late April 2017, this game is in the process of being ported from Game Maker to MonoGame for Mac/Linux compatibility. News updates related to this game can be found at its dedicated Tumblr blog. Rearranged initialization code; miner upgrades should be working on relaunch again, even if you purchased them before the patch and found them wiped out after closing and reopening the game. The new implementation of the dialogue queue skipped to the end if it had more than one item in it. This has been fixed. Arithmetic issue (involving subtracting a small number from a number higher than 8 digits in length) has been corrected. Mining text now "fades" properly again. Changed dialogue queue to use a static data structure; this should prevent the crash bug people have been running into. Removed event that caused miner count to cap at 41 instead of 40. Tweaked the miner button to prevent it from staying active after 40 miners have been hired. 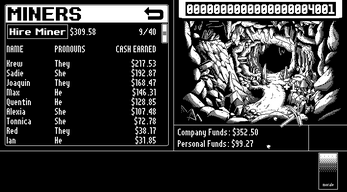 Added indicator on bottom-right of cave that appears whenever the game autosaves (~once per minute). Two typographical errors have been fixed (including an embarrassing pronoun slip-up in Chester's description). Hire Miner button sometimes stops responding to clicks after 20 miners have been hired. If this happens to you, simply back out of the Miners menu, re-enter it, and try again. There will be one more patch, mainly focused on creating Omicron portraits for dialogue. Future patched versions will replace this one, for the benefit of those using the itch.io app. The original will remain up as an optional download, for those who want to see the version I put together for the event.